B2MeM Challenge Roles and names of Aragorn1- warrior; ;Emotions- joy; I Love in M-e - love at first sight; Book Titles- Silver on the tree. First Lines- It is a truth universally acknowledged that a single man in possession of a good fortune must be in need of a wife. Summary: Aragorn walks amongst the birch trees. It is a truth universally acknowledged that a single man in possession of a good fortune must be in need of a wife, or so he had heard folk say. Estel, or Aragorn, as he now knew his true name to be, laughed at the absurdity of the idea. He was a warrior, already skilled with sword and bow and intending to become mightier yet, not some lovesick fool who would spend his days helping his wife wind wool by the fireside! He was not just any warrior either, but the heir of the great Elendil, the latest scion of the mighty line of the Sea Kings. He supposed he would have to marry someday to beget heirs, but compared with feats of arms and the companionship of his fellow warriors, marriage seemed but a dreary duty to be undertaken at some distant date in the future. Like all young men, he knew the urges of flesh could be troublesome, but they were nothing that a good bout of sword practice could not remedy. He had a loving mother and foster family and his companions in arms from amongst the Rangers. And when he was not fighting, he spent his time studying healing and lore. What more could any man need? 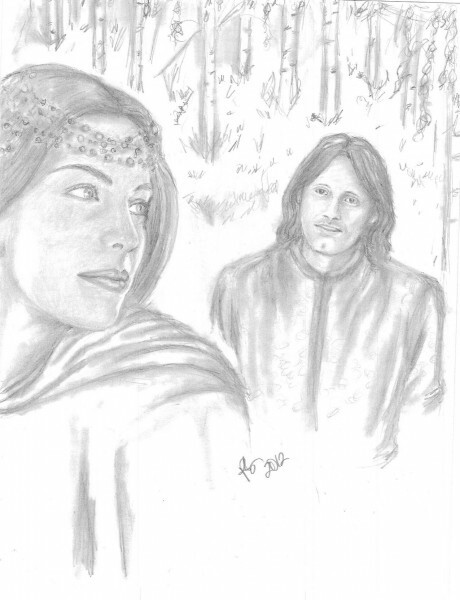 Aragorn put all thought of women from his mind as he walked through the woods, pondering over what Master Elrond had told him. His mother had often told him that his father was a mighty warrior and Aragorn had strived to equal his sire in feats of arms, but to think that the shards of the great sword Narsil now belonged to him! The sword had achieved the mightiest of deeds. Aragorn started to sing softly to himself as he walked beneath the birches. His heart was filled with joy to know he was of such high lineage. He sang the Lay of Luthien, marvelling that Lúthien and Beren were in fact his forebears. He wondered idly if any woman could truly be as fair as Lúthien. It was the hour before sunset and the shafts of light turned to silver on the trees, giving the birch wood an especial beauty. It was then that he espied her, a maiden walking amongst the trees. Had he strayed into some wondrous dream? Surely this was Lúthien herself reborn? No other maiden could be so fair! For a moment he stood as if entranced, fearing she might vanish from his sight even as he gazed. Then he called out “Tinúviel, Tinúviel!” as did Beren long ago. The maiden turned and looked upon him. She smiled. Emotions he had never known before seized Aragorn, a strange mixture of joy and fear of hope and of yearning. His heart thumped and his stomach churned. So this was love at first sight, of which the poets spoke? All he knew was that he wanted this maiden beside him until the end of his days. Aragorn realised he was indeed in need of a wife!